You can now fly into Shirdi for your darshan of Sai Baba! Air India, SpiceJet & Truejet now have DAILY DIRECT FLIGHTS to Shirdi from Delhi, Mumbai and Hyderabad (which will eventually be extended to connect Vijayawada as well). 2 hours from Hyderabad and 2.5 hours from Delhi. This is giving tremendous boost to tourism in Shirdi and in turn, create massive demand for luxury hotel rooms – making this the best time for you to invest in these 3-star serviced apartments at Shirdi. What is this Starlit Suites serviced hotel apartment concept? Why should you invest in Serviced Apartments? How does Starlit Suites generate such high monthly income? How much will you earn every month? What makes this income so predictable & stable? Can you sell off this apartment after sometime? Where in Shirdi is this located? Documentation involved & how to book your unit? 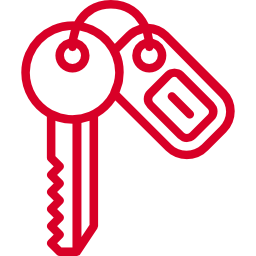 Why go through all the stress & hassles of buying & renting out property on your own to ultimately earn just 2% to 4% per annum, when you can earn almost 4 times as much – i.e. 8% to 10% per annum – without any maintenance or involvement from your side by investing in these serviced apartments? 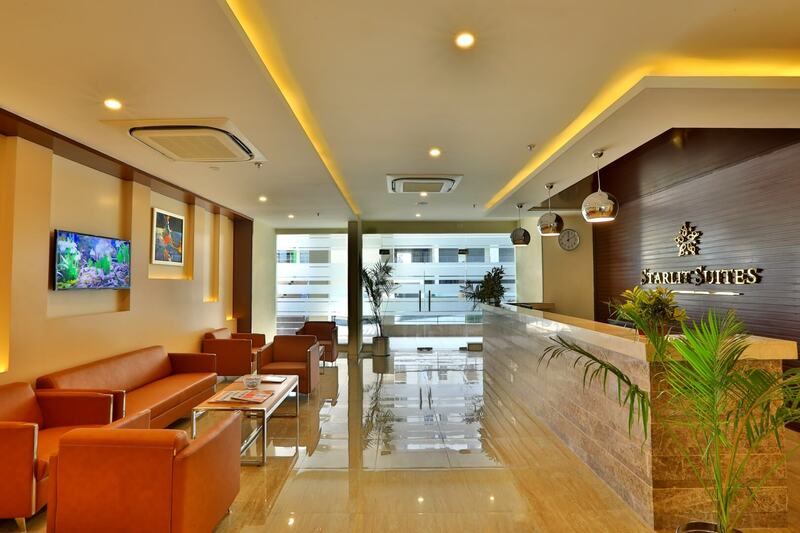 What is Starlit Suites / Serviced Hotel Apartment Concept? 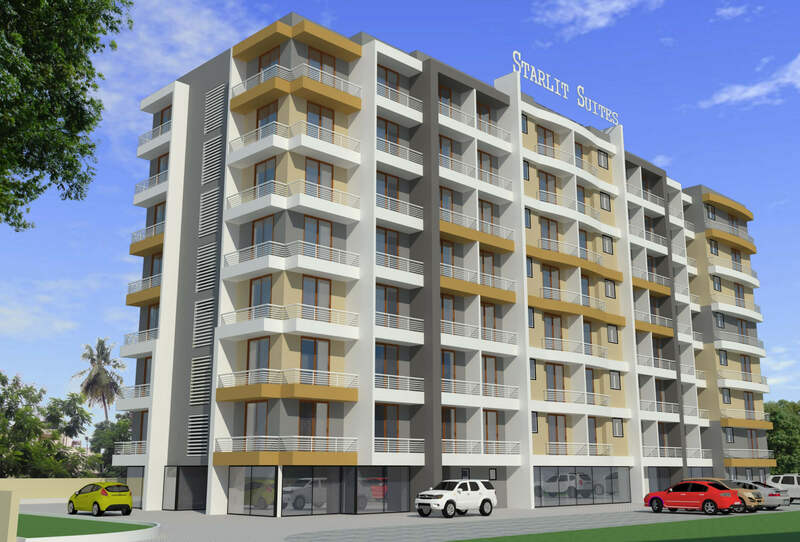 Starlit Suites is a leading 3 star serviced hotel apartment operator of India and by investing in their hotel apartments in Shirdi and other major cities, you can earn highest monthly income of Rs.55,000 per month and more, on lowest investment of just Rs.70.51 lakhs (2 BHK). You invest in a fully furnished, fully air-conditioned and fully serviced hotel apartment (2 BHK) that will be built to the standards of a 3 star hotel. The unit is owned completely by you (registered in your name just like any other apartment) but is operated and managed by Starlit Suites Group and marketed to the leading Indian corporates and MNCs (incase of metro cities) and tourists & vacationers / pilgrims (incase of tourist or spiritual destinations like Shirdi & Tirupati) as a 3 star extended stay serviced hotel apartment. The operator already has rate contracts and formal tie-ups with over 200 leading companies in India – including many Fortune 500 firms such as Cisco, Dell, HP, TCS, Wipro, Infosys, etc – whos’ employees stay in these hotel apartments when they travel on work, thus giving the operator assured business / occupancy throughout the year. Incase of spiritual destinations like Shirdi and Tirupati, the operator has tie-ups with leading travel agencies, online portals (like Makemytrip.com / cleartrip.com / booking.com etc) and event management companies to capture casual tourists / vacationers / pilgrims as well – in addition to corporates. The total gross revenue generated by all the units in the entire hotel apartment tower is then shared in a 50:50 ratio between you (the investor/owner) and Starlit Suites (the operator). This means you earn rental ROI of 8% to 10% in the beginning – which is 3 to 4 times greater than rental income from normal apartments or villas – and the income grows to as much as 20% per annum over time. The operator Starlit Suites is a leading player in his category and is currently managing hotel apartments at Bangalore, Cochin, Pune & Neemrana, with towers under construction at 6 more cities of India. You can view their complete profile in the “Annexure” section at the end of this page. Continue reading to know more and also see the “ANNEXURE” section at the end of this offer document for exhaustive information on income projections, payment schedule, location map, floor plans and much more. Right next to Shirdi Railway Station (Sainagar) & 10 minutes walking distance to the Ashram. Purchasing a regular apartment and then renting it out will only give you 2% to 4% returns per annum. In comparison, serviced apartments give you 8% to 16% ROI per annum. These hotel apartments are managed & maintained completely by the operator at his cost – thus freeing you of the hassles involved in renting out property on your own. Over 380 investors round the world are already reaping benefits of this investment as Starlit Suites – with their rich experience of 37 years in hotel industry – has perfected this model over the last 6 years and is successfully operating 4 hotel apartments at Delhi, Pune, Bangalore and Kochi. Priced at just Rs.70.51 Lakhs ALL INCLUSIVE and with the availability of loans for upto 60% funding, this is a very affordable investment for everyone. You pay just 40% or Rs.28 lakhs from your pocket and rest is funded by bank. Each month’s income is credited directly to your bank account through ECS on the 25th of the following month, making collection of rent a stress-free and automated experience. You don’t have to worry about timely payments or collection and encashments of cheques etc. – You get 7 days free stay per unit owned by you per year, with complimentary breakfast. – Out of this, 4 days can be at any location where Starlit is operating and balance 3 days can be availed at the location where you have invested (in this case, Shirdi). – You can accumulate the same for 2 years and also can gift free stays to family, friends and colleagues. 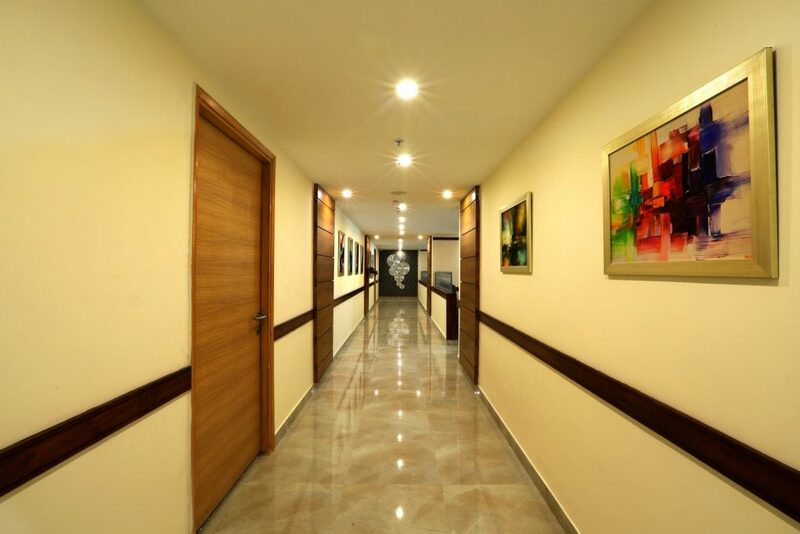 Unlike a normal apartment where EMI is 2 to 3 times greater than rental income, incase of serviced apartments, income is always greater than EMI and hence the project pays for itself and due to such excess income, you will recover your entire initial investment (i.e.40% of unit cost) within 8 to 9 years. Apart from monthly income, you are also going to earn capital gains as you are acquiring an asset in very prime and key commercial localities of key cities of India. Normally, it would not be possible to acquire such prime property at such low ticket sizes and because of this, you will also enjoy tremendous capital gains in addition to high monthly income. 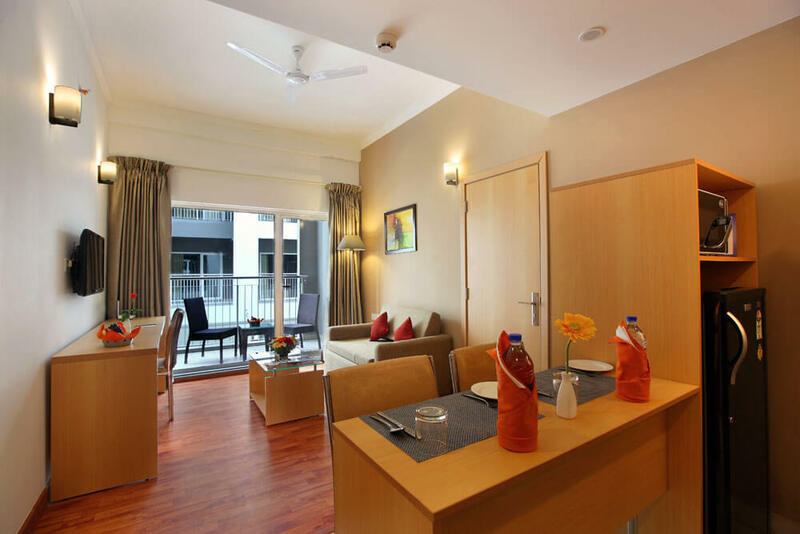 How does Starlit Suites serviced apartment generate such high monthly rental income? A custom designed serviced hotel apartment tower is constructed by a leading builder, with all the facilities of a 3 star hotel such as gym, pool, bar & restaurant, meeting rooms, etc. 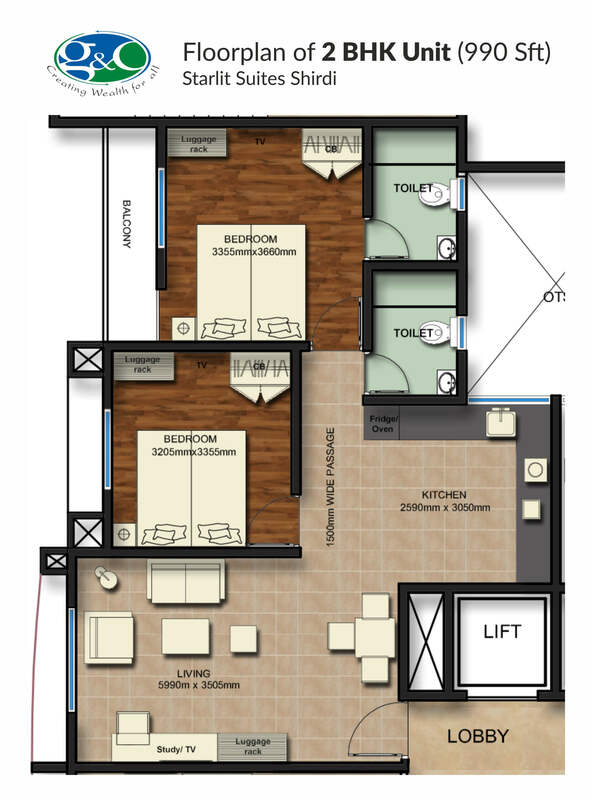 The tower consists of a mix of Studio, 1 BHK and 2 BHK units (depending on demand in each market which varies from city to city) which are fully furnished to support extended stays with facilities like microwave, cooktop, fridge, etc. Individual investors like you would buy 1 or multiple units which will be owned completely by you & registered in your name. The price quoted is ALL INCLUSIVE – that is, basic cost of the unit plus cost of furniture, fitouts, taxes, deposits, registration and stamp duty. You pay the total unit cost in instalments linked to progress of construction. You can get home loan for upto 60% of unit cost, which means only 40% is paid by you and balance is funded by bank. At the time of booking your unit, you also enter into a 20 year RMA (i.e. Rental Management Agreement) with Starlit Suites, the hotel operator. Once construction is complete, you along with all other unit owners in this hotel apartment will handover the keys of your respective units to Starlit Suites (the operator) on the basis of the above mentioned RMA for next 20 years. 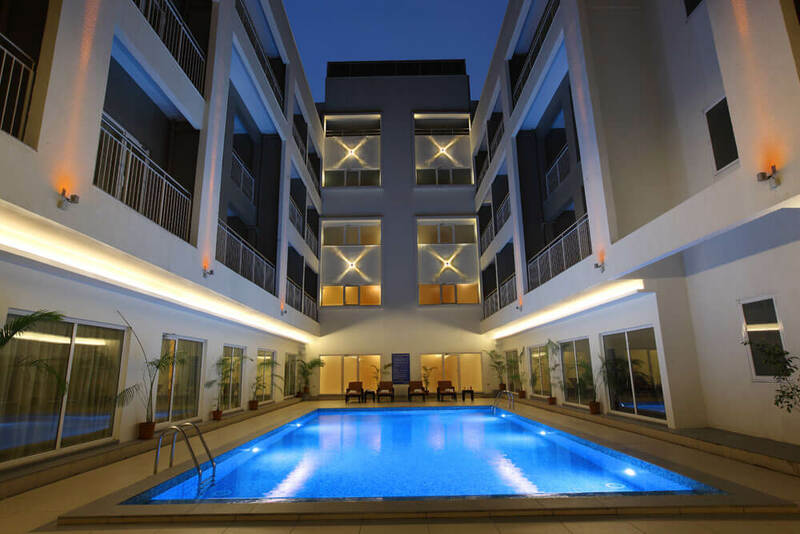 Starlit Suites (the operator) will then bring in manpower and working capital to run this hotel apartment and rent out rooms / units for extended stays to employees of India’s leading corporates and MNCs (including Fortune 500 companies). 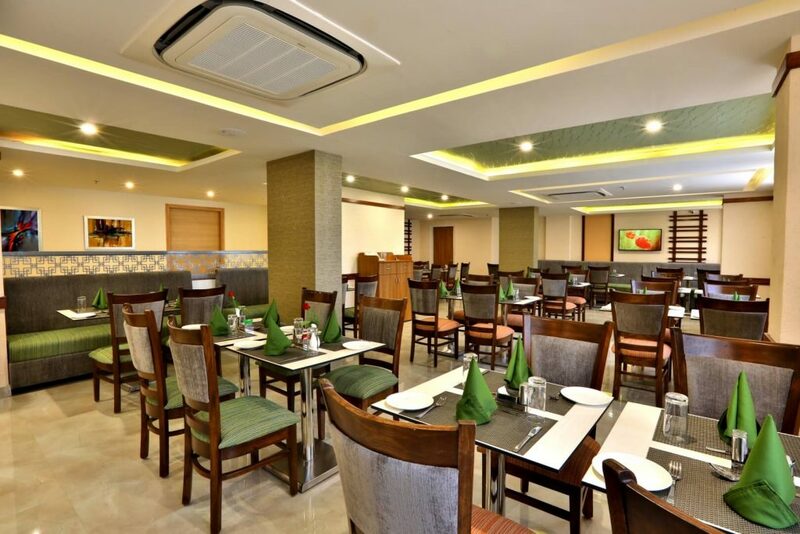 The operator has formal tie-ups / rate contracts with leading firms across India (such as Infosys, Wipro, Cisco, HP, Dell, HCL, TCS, Biocon, etc) which ensure continuous demand / occupancy for rooms throughout the year. The total gross income generated by ALL the units in the tower is then pooled into a SINGLE BUCKET at the end of each month and then 50% of such total income is distributed equally among all investors – ofcourse based on the size of unit / proportion of area owned by them in the tower. Your share of the above 50% paid to all unit owners translates into annual returns of approx 7% in Year 1, 8% in Year 2 and 10% in Year 3 and this keeps increasing year on year to almost 16% p.a. by 20th year – which means 3 to 5 times greater rental income than that of regular apartments or villas. Since income of all rooms is pooled into a single bucket and then divided equally among all unit owners, you will earn as much income as any other similar unit owner – irrespective of whether your own particular unit is occupied or not. Since you and other unit owners are being given 50% of TOTAL / GROSS income – that is total revenue BEFORE any expenditure is deducted by operator – you will always earn high rental income irrespective of the expenses incurred by the operator. Your income is credited directly to your bank account through ECS credit on the 25th of every month – which means absolutely no manual collection of rent cheques! * For the 1st & 2nd year, you get 40% of total income and from 3rd year onwards, you get 50% of total income. This is done as operator incurs massive expenditure in marketing & promoting the new building in the beginning and is hence given 60% of the total income in the 1st & 2nd year and from 3rd year onwards, the total income is shared equally in a 50:50 ratio between you (the investor) and operator. You can see that ambiance & quality of rooms are on par with 3-star hotels. What is the rental income per month? On average & in the beginning, you will earn approx Rs.55,000 per month on a 2 BHK of Rs.70.51 lakhs – translating to 10% ROI per annum. Over the next 15 to 20 years, this income will grow to as much as Rs.90,000 per month gradually – translating to almost 18% p.a. For you to know how much you can expect to earn per month from year 1 upto year 20 and beyond, the operator has created a detailed Income Projection Sheet (PDF), based on the occupancy levels he expects to achieve and the room rates he can charge based on the rate contracts that he has with his clients. Operator has assumed average occupancy rate of just 70% throughout the lifetime of the property – which is a very conservative estimate as he is running his existing properties at a much higher 75% to 80% on average. Even the room rates he plans to charge are very conservative compared to other hotels in the surrounding areas – infact Starlit Suites gives you 2 to 3 times larger rooms for 50% to 50% LESS than comparable hotels. Click here to view this Income Projection Sheet (will open in a new browser tab/window). 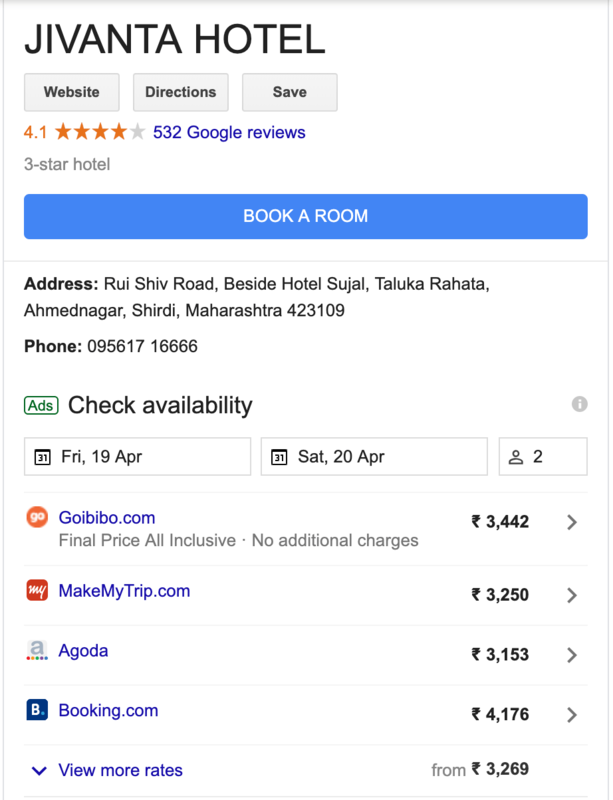 In Shirdi, comparable 3 star hotels charge between Rs.3,500 to 6,000 per night for a standard double room which is on average 250 to 300 sft in size. Starlit Suites Shirdi on the other hand is giving you a 690 Sft 1 BHK & 990 Sft 2 BHK rooms at an average rate of just Rs.3400 per night – which means you are getting 2 to 3 times larger room for almost 40% to 50% LESS than the cost of comparable hotels in the same area. 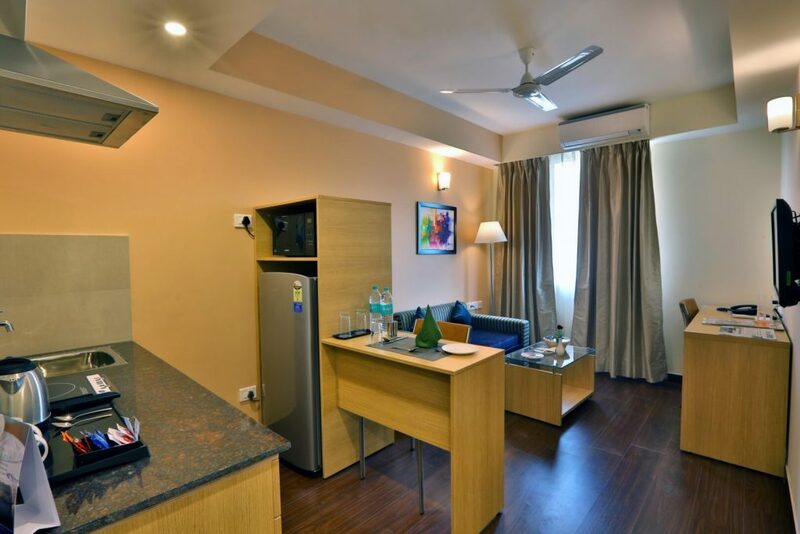 This makes Starlit Suites an incredible VALUE FOR MONEY option which attracts lot of business from not only tourists but from corporates as well. * Prices quoted here for comparable hotels are for a Double Occupancy Cancellable Booking with Breakfast. 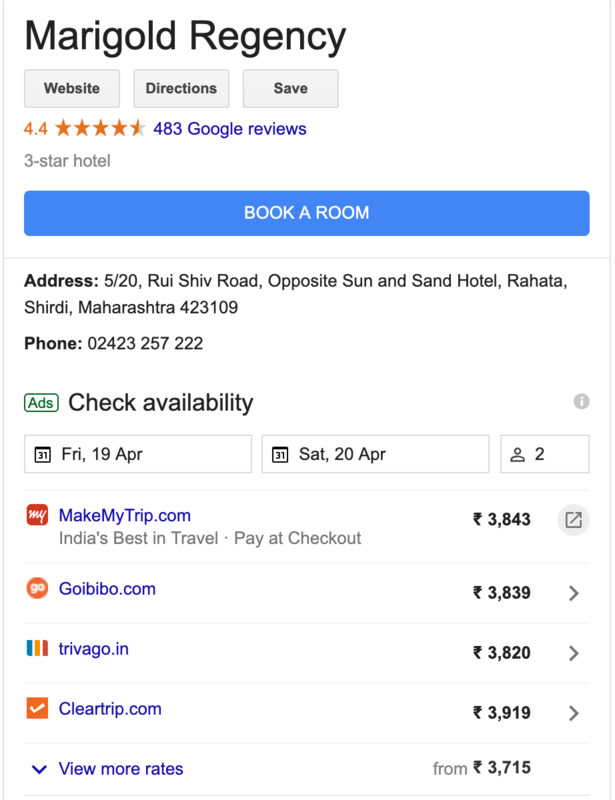 Many price comparison or online booking websites show prices that are AFTER DISCOUNT / COUPONS and EXCLUDING breakfast or NON-CANCELLABLE rates which might be misleading and hence always consider above when comparing prices with Starlit Suites. Such hidden charges could add as much as 20% to the basic cost of a room. 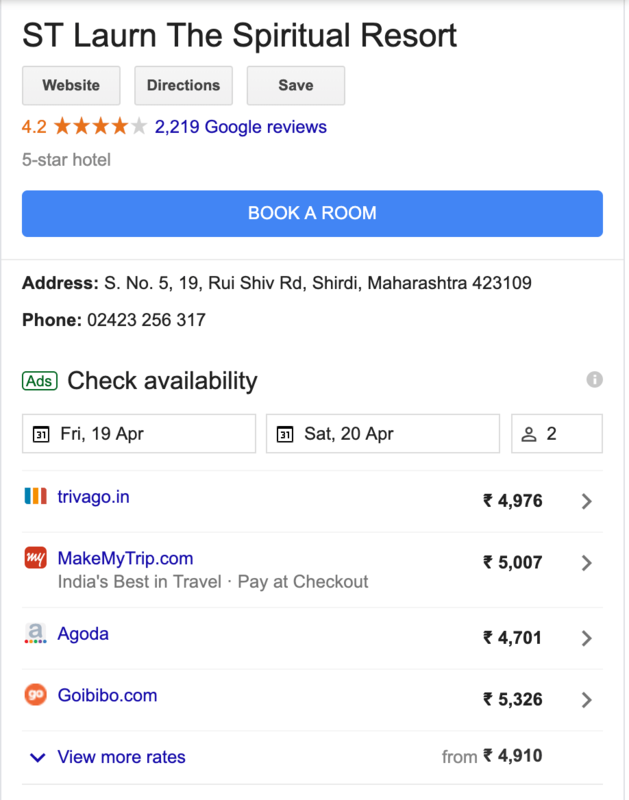 While online portals give you massive discounts once in a while, the hotel is actually getting paid a much higher rate as the discount is borne by the booking portal and NOT the hotel. 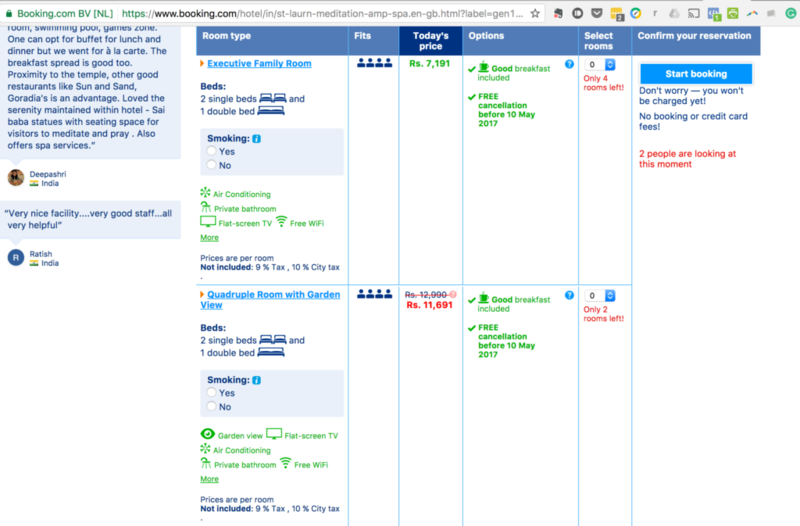 Shown below are screenshots of the world’s most popular hotel reservation websites – booking.com and expedia.com where you can clearly see the kind of rates being charged by top comparable hotels in Shirdi as of today. Rates shown below are of Standard Double Rooms which are comparable only to 1 BHKs in Starlit Suites Shirdi, whereas we will also have much bigger 2 BHKs too. Therefore, compared to rates of existing hotels, Starlit Suites is going to be much more affordable / cheaper despite providing the same quality of service, amenities and ambience. 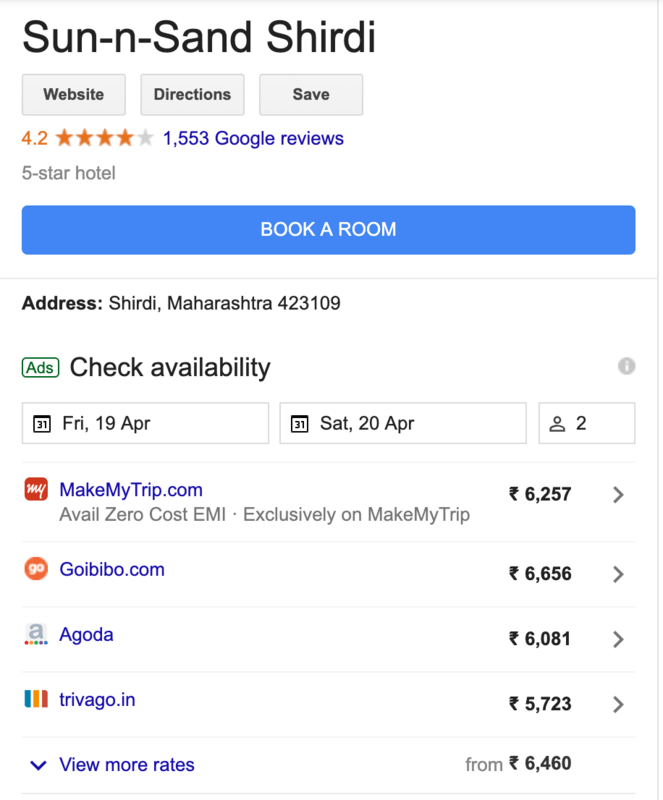 Please note that rates shown in below screenshots are EXCLUDING BREAKFAST (unless mentioned), for which you are charged an extra of Rs.450 to 800 per person depending on hotel category. You get 7 nights free stay per unit per year, with complimentary breakfast. Out of 7 nights, 4 nights can be used at any Starlit Suites tower across India. 4 towers are currently operational, 6 under construction and 20 more in pipeline. What makes this income so predictable and stable? What is the guarantee that I will earn the income that is being showcased here? This model is tried and tested and has been running successfully for the last few years at Bangalore, Cochin and Delhi-Neemrana. The below features make it a foolproof investment where all your interests are safe guarded & no one can manipulate your investment or its returns. Since income from all the rooms is combined into a single bucket and then divided equally among all investors irrespective of whether their particular unit is rented out or not – you will still earn as much as every other unit owner in the building. Hence, you need not worry about whether your individual unit is getting rented out or not. The operator has already established relationships with over 200 MNCs – including many Fortune 500 firms – and signed formal rate contracts with many of them, which gives him assured business / occupancy for rooms throughout the year – which in turn means consistent monthly income for you. You get 50% of Gross Income – which is TOTAL INCOME BEFORE any expenses are deducted by the Operator – and hence there is no scope for manipulation and making your income independent of expenditure incurred by the operator. This means operator cannot inflate expenses and show less profit to try and cheat you etc. Once every 3 months, you are given Audit Certificate (issued by a Chartered accountant) giving you details of the entire revenue generated by the building for each month and how that income is being split between operator and investors. This along with above aspect of sharing of gross income will ensure highest level of transparency as this leaves no scope for operator to manipulate accounts in any manner. Since payments are made by companies by RTGS / cheques or by employees’ credit card, there is hardly any cash involved and hence no scope for operator to manipulate occupancy figures to hide any income. Even incase of bookings by casual travellers, systems have been put in place by the operator to eliminate any unaccounted occupancy. As an investor, you do NOT incur any expenditure for day to day management or operations of the hotel tower. All expenses are incurred by the operator OUT OF HIS SHARE OF THE INCOME and hence such expenditure does NOT affect YOUR SHARE of income. Staff salaries, electricity & water costs, licenses, etc and all and any expenditure related to day to day operations are paid for by the operator out of his share of income and hence will not be paid or shared by you. Your unit comes with furniture, appliances and fitouts included, which are executed by the operator to ensure highest quality. Incase of any damage to the items, they are replaced at the cost of the operator and hence you as an investor need not worry about the quality and safety of your furniture or having to pay for repairs and replacements etc. The operator takes complete responsibility for maintaining the property on the lines of a 3 / 4 star accommodation AT HIS COST to ensure highest occupancy. This automatically ensures the highest upkeep of your property and strong capital values and appreciation. 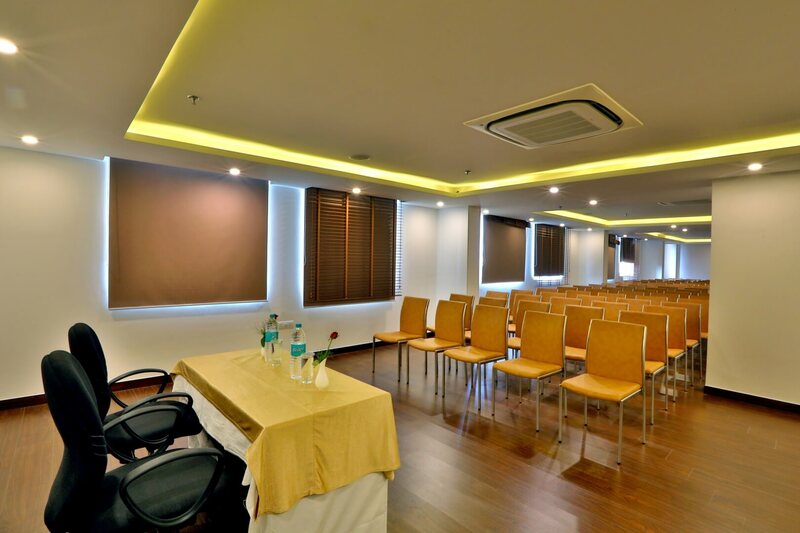 To keep the hotel fresh, new and relevant to changing tastes and amenities, the operator carries out overhauls / upgrades of major equipments and amenities of the hotel (such as lifts, carpets, exterior facade, power back-up generators, etc) which needs a significant investment once every 8 to 9 years. Instead of expecting investors to invest once again out of their pockets, the operator creates a corpus of funds by setting aside 3% of your share of income into a separate account called a “Sinking Fund”. This money & the interest earned on the same belongs to you and all the other investors jointly is used to make such large changes and overhauls. This way, you will not have to invest extra money once every 8 to 9 years which is very important and has to be done to keep the building and rooms attractive to guests in the long run. Is there enough demand for serviced apartments in India? The operator’s main target is the corporate traveler who travels for training, conferences, exhibitions, short-term projects, etc. where typical stay lasts for 10 to 14 days on average and can extend up to as much as 6 months to 1 year in some cases. Another big target segment are employees who have been relocated to a new city or fresh hires who are being given 15 to 30 days of free accommodation by their employer. 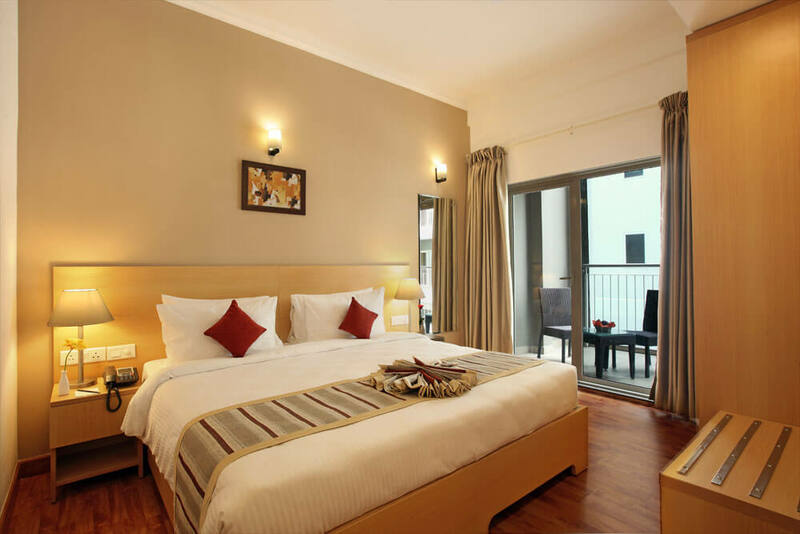 Incase of spiritual destinations like Shirdi and Tirupati, even casual tourists / pilgrims are increasingly preferring serviced apartments as rooms are 2 to 3 times larger and more importantly, 30% to 50% CHEAPER than hotel rooms. Such long term travellers always prefer a serviced apartment over a regular hotel because they can cook their own meals, order room delivery of food from their favourite restaurant and entertain guests in their rooms – which is not possible in star hotels. And they can enjoy all of this with an ambiance similar to a 3 star hotel, but in much bigger rooms with more space – giving them a comfortable “home away from home” feel. After salaries and office rent, the 3rd biggest expenditure for companies are employee travel related costs. Serviced apartments are 30% to 40% cheaper than hotel rooms, which results in tremendous cost savings for companies – especially when employees travel for extended periods. The operator also complies with their requirements for fire and safety measures, ensuring highest safety for their employees in line with corporate insurance policies. This coupled with close proximity of these hotel apartments to major IT/ITES, finance & other business hubs, is greatly contributing to the increasing demand for such corporate serviced residences across India. To understand their leading position in India in this segment and their unique strengths to ensure good monthly income in the long run, click here to read their profile. There are NO organized or established serviced hotel apartment chains / operators in India, that too with multiple properties across the country. Existing serviced apartments are fragmented, unorganized and mostly run by individuals or part time players who have no expertise in the business and are limited to just one location or city. Starlit Suites is the first organized & branded player in the Extended Stay Segment across India with properties in multiple cities (4 operational, 6 under construction and 20 more in the pipeline) and is hence leading the market. Other hotel brands are focused entirely on the Short Stay Segment which is completely different and DOES NOT COMPETE or COMPARE with serviced apartments – as the target customers, pricing, duration of stay, facilities provided are completely different in both these industries. Starlit Suites focuses purely on Extended Stay segment for corporate travellers which has a much larger audience + consistent, predictable and growing volumes year after year. Can you sell this apartment after sometime & exit? You can sell your unit to anyone at any point of time and exit with substantial capital gains, in addition to the monthly income that you would have earned until then. Current FD rates in India are at an all-time low of 6.75% per annum and are set to fall further to as low as 5% over the next few years. Rental income from residential property is a minuscule 2% to 4% and falling. Commercial property may give you 7% to 8% ROI but they need a much larger investment of Rs.3 to 5 crores which is impractical for most of us. So people will happily buy any asset that gives you more than 9% to 10% ROI – which Starlit Suites exceeds by a large margin as it gives you 8% to 10% in the beginning which grows to as much as 16% to 18% by 15th year. Investors would queue-up outside your door to buy such a high income generating asset from you as there are no other safer, stable and predictable income alternatives in India. Since these apartments are fully furnished, fully air-conditioned and fully serviced and come with a long lease with high monthly income, they will appreciate a lot more than regular apartments or villas. Small ticket sizes and availability of home loans make these highly affordable and easy for anyone to invest in Starlit Suites, because of which there is massive demand for such assets – making it easy for you to sell whenever you want to. 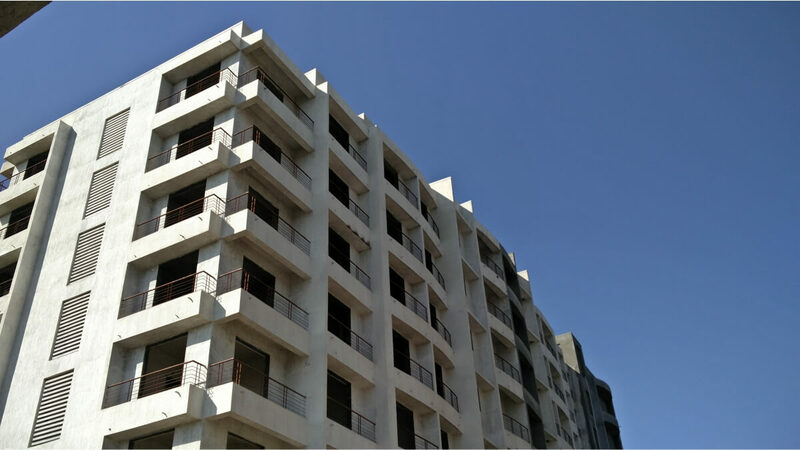 We receive enquiries on daily basis from many investors who are eager to purchase such high income assets and hence reselling your unit will be easy due to such waiting list that builds up in each city. 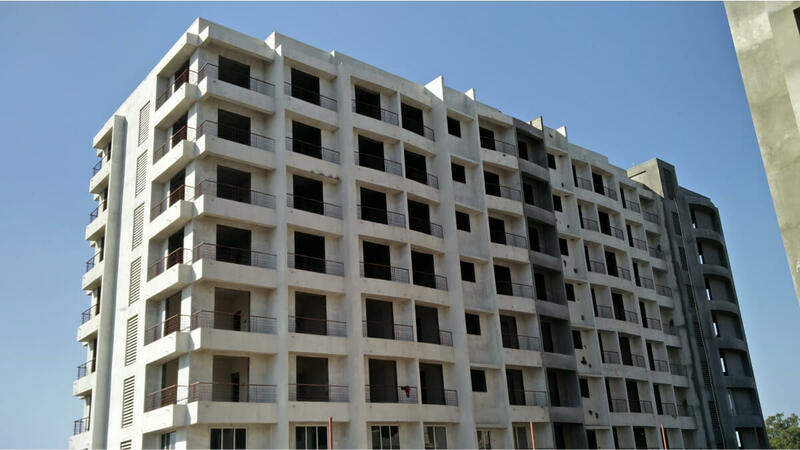 For example, at Bangalore where we did our first tower (126 room hotel at Electronic City), we have a waiting list of over 57 people who are eager to buy any unit that may come up for resale. The person who is buying this asset from you would start earning rental income immediately (i.e. from Day 1 of his investment) and thus would be willing to pay you a premium to buy such a proven asset from you. You can also show your bank statement as a proof of income being generated by your unit. For every unit you own, you get 7 nights of FREE stay with breakfast PER UNIT PER YEAR. Out of these 7 nights, you can spend 4 nights at any other Starlit Suites location (currently operational at 4 locations, 3 more to get added by end of 2017 and 20 other cities eventually over the next 6 to 8 years). That is, if you invest in Starlit Suites Shirdi, you can use all the 7 free nights at Shirdi or use upto 4 nights at any other location such as Bangalore, Hyderabad, Delhi-Neemrana, Tirupati, Pune, Cochin, Kolkata, Trivandrum and balance 3 nights at Shirdi. You can also gift these free nights to your family, friends and colleagues and any unused free nights can be rolled over to the next year (for a maximum of 2 years). When you invest using a home loan, the income from these hotel apartments will be greater than the EMI you pay on your loan. This is because your EMI is calculated at 8.8% (current floating rate) on 60% of unit value, whereas you are earning income of 8% to 10% on 100% of unit value. For example, when you buy a Rs.70.51 lakh 2 BHK by taking 60% loan which is Rs.39 lakhs, your EMI would be approx Rs.36,500 per month, whereas income in Year 1 itself is Rs.39,000 per month – which means you are left with profit EVEN AFTER paying off your EMI. Because of this excess income (which keeps increasing every year as EMI remains same but income keeps increasing), you will accumulate enough funds to recover your entire investment of 40% in 8 to 9 years time. Post this, you will continue earning monthly income FOR FREE as technically, you are earning this on ZERO investment (as you have recovered your entire initial investment). Therefore, investing in this hotel apartment using a home loan is the smartest way to create wealth and earn higher ROI in the long run. Even if you can afford to pay the entire cost of unit from your own funds, it is financially more lucrative to invest using a home loan. You want to generate an increasing & continuous stream of high passive income to supplement your primary source of income and elevate your lifestyle. You want to build a secondary source of income as a back-up / insurance against job loss, etc in these increasingly uncertain times. If you dream of retiring early or are on the verge of retirement and want to create a steady stream of stable, predictable and high monthly income. If you are an NRI yearning to return to India but are unsure or have no safe way to generate a consistent monthly income to maintain your current lifestyle that you enjoy abroad, once you are back in India. If you are an NRI who has settled abroad and decided not to come back to India forever but want to take advantage of India’s booming economy and real estate story – for which this asset is the best way to participate in India’s growth. If you dream to own a chain of hotel rooms across India by investing in multiple micro assets across top cities of India instead of sinking all your money into a single asset in just one city. If you want to own an asset that is entirely managed by India’s leading professionals rather than having to manage them yourself. If you have already retired and want a safe investment that can generate monthly income without having to lock-in your capital for a long time, which is the case with most of the options available today such as FDs, Provident Fund, finance or chit fund companies which provide low monthly returns, no capital appreciation and also block your funds for a very long time. Visit the FAQ (Frequently Asked Questions) section to find answers to almost any question or concern that you may have regarding this unique high monthly rental income asset. Construction of structure is complete and interiors are being fitted-out. Trial operations expected to commence by August 2019. Located right next to the Shirdi Railway Station and just 10 minutes from Shirdi Sai Baba Ashram, Starlit Suites is located close to the main ashram but away from the noise and dust of the main central road. With Shirdi’s masterplan execution on fast track to be ready in time for Sai Baba’s centennial celebrations in 2017, Starlit Suites will be well connected to the ashram and the airport. With a bar & restaurant, it is also close to the only amusement park in town – Wet n Joy, thereby having something for both children and adults. A huge and increasing influx of pilgrims has catapulted Shirdi into one of the most highly visited tourist and pilgrimage destinations in the world, thus giving immense scope for the hospitality industry (i.e. operators like Starlit Suites) to grow and flourish in perpetuity. 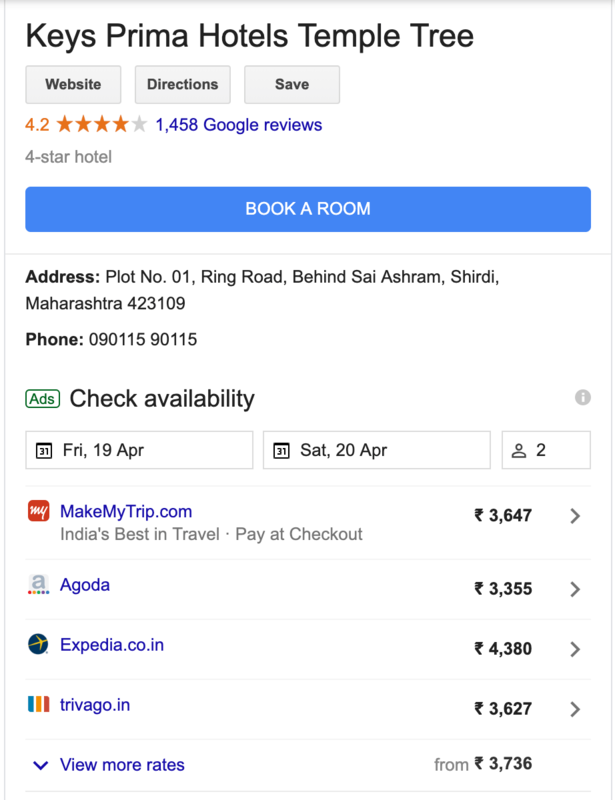 Even if just 1% of above traffic is capable of staying in a 3 star hotel, it is enough to fill-up the ENTIRE STOCK of 3 star hotel rooms in Shirdi, including Starlit Suites – infact the number of rooms available in Shirdi would NOT be enough to cater to even 1% of the daily traffic! And with the new Shirdi airport, traffic is only going to increase year after year! This has given tremendous boost to tourism in Shirdi and in turn, create massive demand for luxury hotel rooms – making this the best time for you to invest in these 3-star serviced apartments at Shirdi. The builder is a large infrastructure group having executed construction of Jetties, Wharves, Culverts, Retaining Walls, Mooring Dolphins, Bridges, Reclamations, Bunds, Residential & Commercial Buildings, Pile Foundation for Oil Refineries, Metro Rails, Buildings, Power Stations etc, and Geo-Technical Investigation for various on-shore and off-shore projects. Marine projects (dockyards, jetties, dry docks, etc) for private and government orgainzations including the Indian Navy. Construction of structure is complete and only interiors are pending and in progress. Trial operations expected to begin from August 2019. Unlike other apartment projects where you are charged an additional premium for floor rise or premium location etc, there are no such additional charges in this hotel apartment and everyone pays the exact same cost irrespective of position of your unit in the tower. This ensures that everyone in the apartment earns equal returns irrespective of unit position. 10% on execution of agreement in 2 – 3 weeks from booking as construction is already at advanced stage. – Incase of home loan funding : Another 15% become due immediately as building is already in advanced stage of completion and home loan will also have to be disbursed immediately to cover balance due. Remaining 5% is payable by August 2019. – Incase of self funding : Another 60% becomes due immediately as building is already in advance stages of completion. Balance 20% is payable by August 2019. Upto 60% of unit cost can be funded via the loan which means you pay only 40% out of your pocket.. Entire loan process will be handled in-house by us on your behalf so you dont have to spend time and energy in running around banks etc. TAX BENEFITS : The EMI paid on the loan can also be written off against the income earned from this asset, which effectively reduces your taxable income. Each month’s income is credited directly to your bank account on the 25th of the following month and hence there is no need for you to monitor or follow-up for collection of income. If you take into consideration the high initial appreciation of capital values in the first 3 years and considering that the asset value might almost double in 4 to 5 years, you may end up earning an average ROI of 30% in 1st and 2nd year alone and hence this is a NO – BRAINER Investment. This is between you and the builder for purchase of the flat and covers the terms and conditions of sale and construction of the hotel apartment and the timelines involved. This agreement will also have clauses to compensate you incase of delays in construction. This is between you and Starlit Suites (operator) and captures the terms and conditions of the revenue-sharing agreement with the operator. It contains important clauses related to revenue sharing, operator’s responsibilities, complimentary stay, period of contract, etc. This is between you and Starlit Suites (operator) and it covers the cost and schedule of items that will be included as part of furnishings of your room as per 3 star hotel apartment standards. This is a legal document giving Starlit Suites the power to operate the unit on your behalf and is a matter of legal formality. Please inform one of our team members who will send you the booking form, which you can fill and send back a soft copy along with details of payment of booking amount which you can pay via net banking or by issuing a cheque. Based on your preference if any, a short list of available units will be sent to you and you can choose from the same to proceed further. All units are priced the same and the returns are distributed equally and hence you can choose any unit out of whatever is available without bothering too much about floor or facing. In addition to booking amount, once you pay 20% of unit cost, agreements will be printed and issued to you for signing, post which they will be sent back to builder for execution and you will be given your set once builder signs the agreements. Balance 80% may be paid as per payment schedule and incase you are going for home loan, the same will have to be disbursed right away. Please contact us on +91 9900123737 / jhashank@gcglobal.in for further info or assistance on home loan application process and to get a free estimate of your home loan eligibility. Invest in Starlit Suites Shirdi and start earning from August 2019! call one of our team members displayed above.